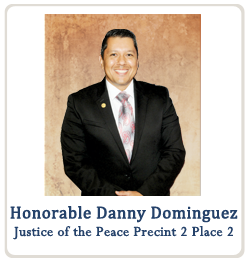 Judge Danny Dominguez is a lifelong resident of South Laredo. As the son and grandson of migrant farm workers, he was taught the value of hard work and the importance of education. He received an Associate Degree in Criminal Justice from Laredo Community College and two degrees from A&M International University, a Master of Public Administration and a Bachelor of Science in Criminal Justice. He has served his community for numerous years as a Deputy Constable, Deputy Sheriff and most recently as a Police Instructor at the South Texas Border Regional Police Academy. Danny has earned numerous state certifications and recognitions. This range of experience and knowledge has enhanced his ability to better understand the cases over which he presides, ultimately providing confidence to "Justice Court".